In an open-air dance hall, the members of Leca's gang are relaxing with their ladies. One of them, Marie, aka "Casque d'Or" (Golden Helmet) meets Manda, a carpenter. Her man Roland belongs to the jealous kind, and Leca himself has his eye on her. A story of love, death, friendship and jealousy during the Belle Epoque. Jacques Becker: cinema as art Jacques Becker was an artist and a director. His legacy is a trilogy of masterpieces: "Casque d'Or", "Touchez pas au Grisbi", "Le Trou", three luminous instances of cinema as art. 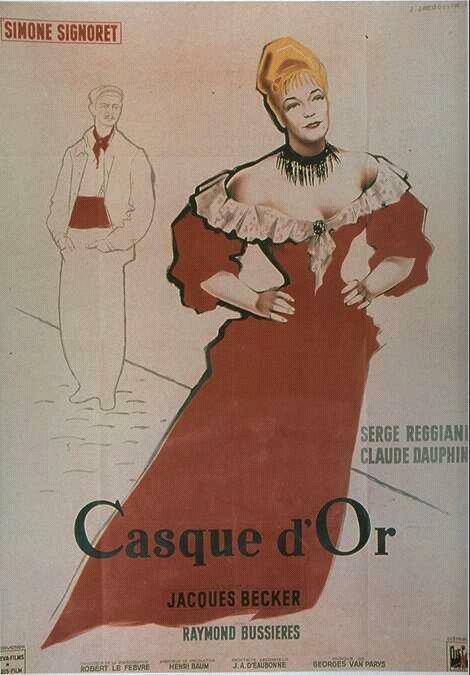 The linear story of "Casque d'Or" has the neatness of a Maupassant's tale. We are transferred into a most glorious epoch for French culture and art: the decline of the 19th century, the age of Impressionism. 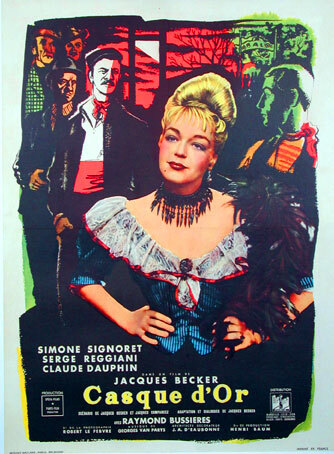 Marie (Simone Signoret) is a blond beauty, a cheerful "lost woman". She's the girl-friend of a member of a gang of small-time but ruthless criminals. She falls in first-sight-love with George Manda (Serge Reggiani) a former crook, now a honest carpenter. Predictable troubles ensue... The atmosphere of the epoch is wonderfully recreated, with a black-and-white photography of indescribable beauty. An Impressionist Master behind the camera couldn't have done better. And, in fact, Becker was a favorite "student" of director Jean Renoir, Auguste Renoir's son. Becker's characteristic narrating style is nostalgic, serene, gently ironic. He deliberately avoids over-dark tones in his representation of the underworld, even in the middle of tragic events. 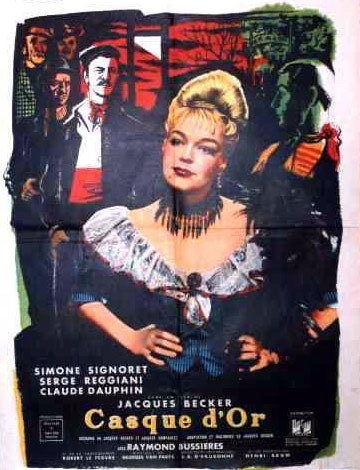 Simone Signoret is a charismatic presence on the screen: outstanding is her use of body-language to draw Marie's character, both a romantic enamoured woman and a cynical harlot. Reggiani is excellent as the laconic, tough Manda: he utters some twenty words along the whole movie, yet we perfectly understand his peculiar honor code, his profound love for Marie, his unselfish devotion to friendship. Splendid is Leca (Claude Dauphin), the boss of the gang, officially a respectable well-off wine-dealer: proficient, cool-headed, extremely cunning and Machiavellian, always ready to betray his own men to pursue his dirty purposes. Indeed, great care is paid to the design of all characters, with superb acting by the whole cast. Exquisite poetic touches permeate the movie... Marie drags Manda into a church, where a simple wedding (of unknown middle-class people) is taking place. Shortly after, Manda is impatient "Let's go", and Marie "No, just another minute"... and she contemplates the wedding with a dreaming smile... "Casque d'Or": a perfect work of art.